Charlie Smith weaves his Big Joe forklift through his warren of machinery as if he were the Pac-Man of an old video game. The machines are relatively of that era—Van Dorns and Hansvedts and CNCs of various types and sizes. On the Big Joe is a thousand-pound S-7 tool-steel mold for a GP 38 Model O engine, whose machined parts Charlie makes for Weaver Models, one of probably less than a half-dozen model train manufacturers who still do all their machine work in the United States. 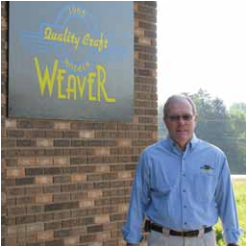 While Weaver itself is a modern business complete with glossy Web pages, international sales team, and a sleek headquarters on the main road in this Central Pennsylvania town—Charlie is from an era long-past, though hopefully never forgotten. “Charlie never trashes anything and he fixes his own machines. He probably has 30, 35 machines in that shop. I only wish someone were there to take all his knowledge down,” said Joe Hayter, the owner of Weaver Models, which will sell one of the GP 38s—scale models of engines found all over the Missouri Pacific and a dozen other freight lines in the 1970s—for $299 from its catalogue. Hayter won’t try to compete in volume with the industry leaders like Lionel, which has gone through several upheavals, bankruptcies and sales since its mid 20th century heyday, or Bachman Industries, a Chinese-owned company with American headquarters in Philadelphia, which claims to be the worldwide model train sales leader—Thomas the Tank Engine and the like. But with custom sales and homespun items like the GP 38, Weaver is a cog in the continuing interest in model railroading. The trade organization, the National Model Railroading Association, claims there are 500,000 enthusiasts, with the largest segment of them middle-to-upper-middle class Baby Boom men, folks like Weaver’s Hayder, who is 64, himself.“In the late 1940s, and then after, it was something every little boy had, or wanted to have, underneath the Christmas tree. There weren’t video games or much of anything that actually moved, so this was it,” said Hayder. Things went a little dormant toward the end of the 20th century as computer-oriented games and toys became the norm. But there seems to be a bit of a revival of late. “Grandfathers are buying sets for their grandchildren, something they can do all together,” said Hayder. Weaver, he said, doesn’t sell starter sets, but caters mostly to collectors and people who know trains a bit. But he said Lionel and the mass-producers do a good job of keeping initial prices low for rudimentary tracks and trains, and then, like in all hobbies, hooked enthusiasts trade up to Charlie-Smith-made Weavers or trains from Bill Donovan’s Real Train Company out in Yucaipa, California. Real Train makes what are called three-inch or one-and-a-half-inch scale—as in that part of a foot—meaning that Real Trains (the brand) are one quarter to one eighth the size of real trains. That means instead of just looking at them circle a board-supported layout, Real Train types put on their railroad caps and ride them. Collection of various Weaver train models. Fifteen years ago, Real Trains was born to do more custom and exotic models. It provides amusement parks with rides—usually the larger three-inch models that run on 15-inch gauge tracks, meaning it is 15 inches from the inside of one track to the inside of another. 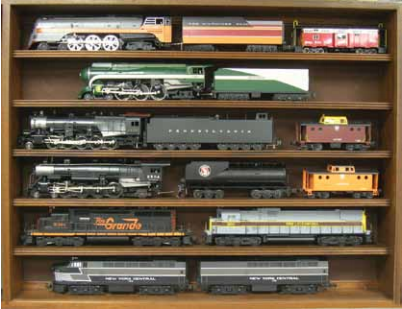 At home, enthusiasts usually go for the smaller models, the one-eighth sized on seven-and-a-half inch gauge—the distance between the inside of the rails. “Amusement parks need it wider to prevent them from tipping over with lots of customers. You do it in your yard and you are more careful, so you don’t need it so wide,” said Donovan. He said it would seem like an expensive hobby, since an entry-level industrial diesel engine goes for about $2300. But, he said, because of the need to have a big space to have a decent-sized layout of track, most Real Train folks belong to clubs, some of which have nominal annual fees just to come out and ride. One club, Train Mountain in Chiloquin, Oregon, has more than 25 miles of track and charges just $50 a year for new members. Modelers of the smaller sort tend to be in clubs, rather than having merely basement layouts, these days. The South Jersey Garden Railroad Society, for instance, rents buildings—often out-of-use department stores—to have mini-conventions every couple of months or so. For a weekend in mid-March, for instance, a vacant former Circuit City store just west of Atlantic City became a convention of sorts for several hundred model trainers—in Hayder’s suggested demographic of granddads and grandchildren. There were a half-dozen layouts of various stripes, from a citified trolley line exhibit to a complex 100-yard countryscape, full of valleys and rivers and barns with chewing tobacco advertisements painted on the side. In the aisles, not unlike big convention sporting and flower shows, there were vendors with used trains and mock-vintage caps and gear and reference works about long-ago engines and boxcars, as well as scale-sized billboards that might be at the Jersey Shore today—touting radio deejays, casino acts, and restaurants and hotels. Joe Hayter outside Weaver Models. “The hobby is what you make of it with price,” said Donovan. “Sure, you can spend $10,000 on something I can make you that will be all detail and finely machined. But people can collect Lamborghinis or drive small cars, too. Certainly not the guys of the New Mexico Steam Locomotive & Railroad Historical Society. They are in the midst of trying to rebuild Baldwin Locomotive Number 2926, built originally in 1944 for the Atchison, Topeka & Santa Fe, the railroad line popularized by the song of the same name sung by Judy Garland. The locomotive, built at the Baldwin Eddystone Works in Philadelphia, took passenger trains from Chicago to Los Angeles and was one of the most powerful steam locomotives ever, weighing over a million pounds and generating up to 4500 horsepower. Number 2926 was retired by the railroad in 1954 and sat in an Albuquerque city park until the late 1990s. Now at a rail siding in Albuquerque, the society members meet Wednesdays and Saturdays to fix it up, and plan to have it running as soon as they are able—maybe by the end of the year—on what is now merely a freight line north from Albuquerque to the Colorado state line. Thornton said they are taking original parts and machining them to fit, or creating tubing for the boilers or engine minutia that has been long gone. Meanwhile, back in his rambling Northumberland machine shop—a low-lying garage-like structure several hundred yards back from the state road in this burg halfway between Philadelphia and Pittsburgh, which means far away from most everywhere—Charlie Smith looks through his “Car Builders’ Cyclopedia: 21st Edition,” which was published, oh, only 50 years ago in 1961. Though most of his newer AutoCads are on the computer—a vintage 1996 model with Windows 98—he still has many original blueprints. What Weaver buyers want are not on President Obama’s high-speed rail lines, but from the times when those train whistles really were ubiquitous. “If you give me the pictures, I can create it for you,” said Smith, whose wife, Carol, has urged him to quit, but who, at 81, finds a triumph in creating the mold for each new Weaver request. He used to be the manager of several manufacturing businesses, but went off on his own in the 1970s. On the side, he tries inventions—a one-cup coffee dispenser; secure roll-up stoppers for toothpaste and cosmetic tubes—but mostly it is just the chance to machine things—though the train molds are his lifeblood. 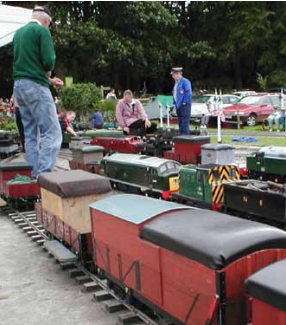 The Ryedale Society of Model Engineers Limited gather at Gilling East, UK. Smith has five injection molding machines, including Reeds and Van Dorns of various sizes in his ramshackle shop, and considers them his most important for the model-train work. This particular day, he was running his 150-ton Van Dorn to make the molding for a three-bay hopper car for Weaver. Later on, he will use one of his three vertical mills—two are Bridgeports and one an Enco—on the car. “I was never into model trains, but these things have so many detailed parts that they are a good challenge. You get to know the trains and why people really love them,” he said.The trains themselves haven’t stopped in Northumberland since the local Baby Boomers were babies, but Hayder loves that he, with the help of Smith, can bring an American-machined product to life. My Dad worked at Lionel trains in Mt. Clemens, MI while I was growing up. When we had our first couple sets, and later when we were collecting harder to find items, I really found the hobby satisfying in many different ways; the historic nature of the trains, the sounds of the whistles, the smell of simulated smoke. I think it builds an early sense of responsibilty, driving hundreds of imaginary people to their destination. Listening to my Dad tell me how to put it together so that the electronics would work safely and the tracks were level had timeless value. But as the article says, my attention was eventually won over by video games, and social activities. However, one day, Dad drove me out to see someone’s private collection. As we descended into the basement, the scene brought back all the joys I ever had with the trains. Here were grown men, with a basement that was completely laid out with scenery, dozens of train lines, a few train stations, a schedule that ran for probably a half hour and enough sound effects to drown out any memories of the video games. We didn’t stay too long, but I’ve relived the event in my mind for decades. I hope model railroading gives many more kids and grown-ups the same memories I cherish. Great article!